Carefully planned lighting and audio arrangements are two essential components to make any event a success. Be it a corporate event, convention, concert, party, stage or trade show, it is important to have a complementary audio and lighting arrangement in place. This is exactly where we can help you at Bishop Audio & Lighting. 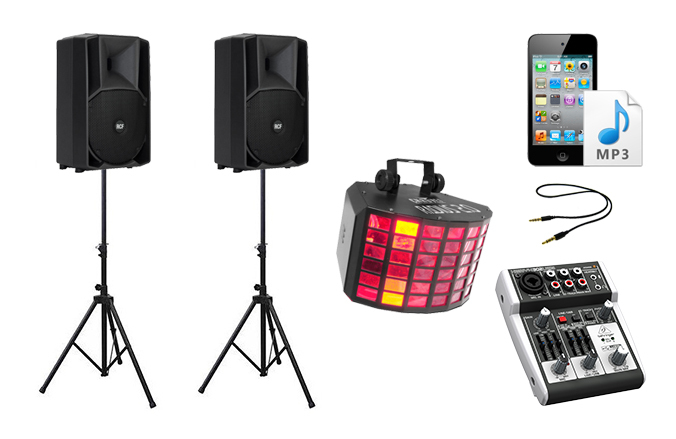 We provide professional audio equipment hire such as powered speakers, portable PA hire, wireless microphones, etc. We also supply a wide array of lighting from effect lights to architectural and decor lighting. Whether you’re planning a large event or small function – individual, business, musician, DJ or band – Bishop Audio can provide the right equipment. Please give us a call or contact us for a quote or any queries. Alternatively book some equipment online or browse our hire list below. Delivery and setup are available. A wireless microphone is supplied plus a built-in anti-shock USB/SD/CD/MP3 player. Built-in wheels and a retractable handle make transport simple and a protective cover is supplied. Choose one of our three available ‘Party Packs’. These packages are designed to suit the needs of most small to medium functions, with ease of set-up and function in mind. All necessary leads and stands are provided as well as easy to understand set-up instructions.